The fae who live in the Lands are broken into orders which, in turn, are split into races, tribes or clans. There are also sub orders and sub races, but here are the main ones presented in this series. Florafae are fairies who align themselves with plants. Their magic is usually tied to plants and music and and they help keep plants healthy. In return, plants provide them with food and shelter. Florafae belong to any of hundreds of clans. Trefoil, Rose, and Oak are just a few. Some are winged. The Cromach, Clovie Trefoil, Mairi and the Heatherghillie are all Florafae who appear in the first title in the series; Clovie Trefoil. Faunafae are fairies who work with animals, birds and other creatures. They help and communicate with these, and are helped in turn. Most Faunafae identify with one species or type of creature, but a few identify with two or more. Some are winged. Aquafae are fairies who identify with water. Unlike Florafae and Faunafae, they vary greatly in size and form. Marsh hags, selkies, lochfae and rainfae are just a few. Most do not have wings. The Florafae regard them as being cold as water. Moll o' the Marsh and the Lochladdie are Aquafae who appear in Clovie Trefoil. Petrafae are fairies who live closely with rock and minerals. Like Aquafae they vary a great deal and many are wingless. The Gemfae belong to the Petrafae order, and so do the great Trolls, the Fossilfae and the Geofae. The Cauld One of Carn is a Petrafae who looks like a jewelled dragon. Fashfae are what you might call bad fairies. They can belong to any order and are fiercely territorial. They do their best to drive away others, and occasionally move in to someone else's area to cause trouble. Boggarts, Bogles and Banshee are Fashfae. Bitterwing the Bogle is a Fashfae, and proud of it. Singular Fae are fairies from any order who do not belong to any clan or tribe. They usually go by a title rather than a name. The Heatherghillie, the Lochladdie and the Cauld One are all Singular fae. The Lands of the Fae is a world close to ours but not a part of it. 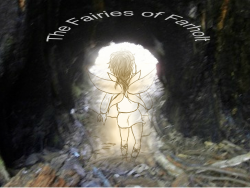 The action in The Fairies of Farholt takes place in the Lands. The Islands of Sky are a group of islands in the Lands. Many Florafae settled there after leaving Farholt. Summer Hay Holt is the main village in the Islands. The Great Cairn of Sky stands on the green in the centre of Summer Hay Holt. The Moor is a wild grassy place beyond Summer Hay Holt. The Marsh is a teacherous boggy area beyond the Moor. The Marsh Hag, Moll o' the Marsh, lives there. The Crags of Lochfee are rocky cliffs often covered by fog. Lochfee is a grey loch, or lake, below the Crags. The Glen is a steep valley with a burn, or stream flowing through it. The burn flows to the ocean. Island of Carn is a rocky island in the ocean. The Great Plat is a dancing place for the Bogles. Farholt is the homeland of the fae. Animals and birds of the Lands are a mixed lot. Most are just the same as animals in our world, except that they live wild and associate with Faunafae. Some have a limited understanding of language, even if they do not choose to acknowledge this. Some, like the tussie, are found only in the Lands. Magic has changed them. Animals mentioned in Clovie Trefoil include the hare, the frogs, the otters and the tussie.